We've had pets that have come and gone around the Sanatorium. Now I think we have one that's here to stay. I'd like you to meet Gypsy. 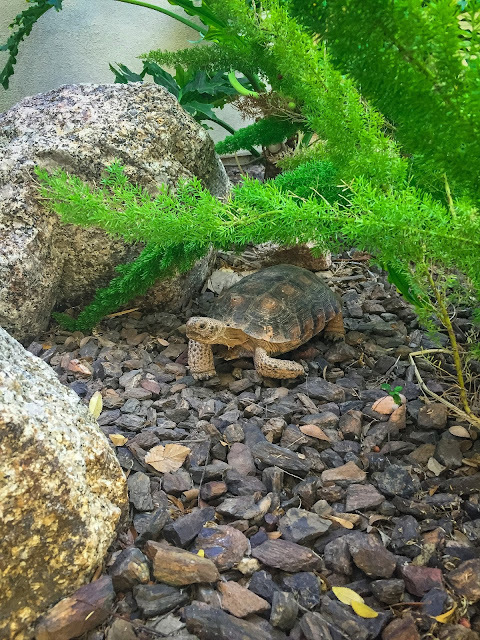 Desert tortoises are often turned in at the Fish and Game Department here because it's illegal to let a pet tortoise loose in the desert (something about the spread of disease or something). We have a friend who works for F&G, and he said he'd find us a new family friend. It's funny how my ideas of owning a tortoise have changed these last two weeks. That girl never sits in one place for long--hence the name Gypsy. I'd hoped for Esmerelda, but Gypsy seems to fit her even better. We've found her wedged between the garbage cans, trapped under a ladder in the garage, even "running" from the irrigation water on the concrete pad in the yard. She's the easiest pet ever. She eats plants in the yard and needs little water. She is good with the kids and she's still small enough to hold (a little bigger than a dinner plate). We don't know how old she is, but with the life expectancy of tortoises, I'm sure my kids will be fighting over who inherits her when Brad and I die. Welcome to the Sanatorium, Gypsy!